With Glittering Eyes: Clothing with a Cause. This week I got another pair of Toms shoes! So last week I decided to purchase them, and I didn't buy just any old Toms shoe, I bought the silver glitter pair. 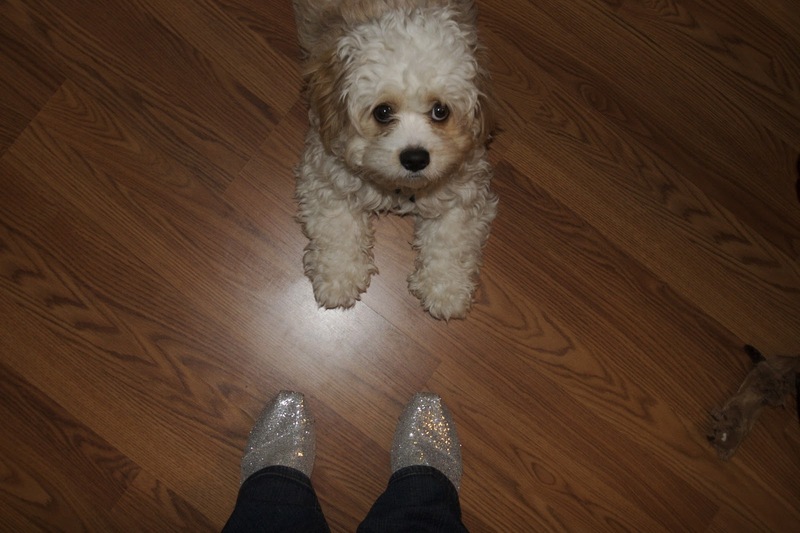 I was SO excited when Mr. UPS man pulled up with my sparkly shoes on Tuesday! (I had been tracking them every day since I bought them haha) so I knew he was coming. Aware of my excitement, Josh exclaimed: "::gasp:: There he is!" when he spotted the big brown truck at the neighbors house. I kind of wanted to sit in the window and wave to him as he forged his way down the long, slushy driveway to our house, but I held myself back. I did meet him at the door, however, but was outdone in my enthusiasm when Buddy actually ran outside to meet him as he was walking away. Oops. Good thing he's a little dog, eh? Buddy loves Mr. UPS man and isn't as shy about showing it as I am. One time, he even ran outside and jumped into his truck to say hello. Anyway, I love the vision behind Toms shoes. When you buy a pair, they send a pair of shoes to a child in need. It's an awesome organization and I love supporting them. PLUS, their shoes are super cute and super comfy. So really it's a win-win-win-win situation. Buddy is a fan of Toms shoes as well. He's also a fan of the little squirrel stuffed animal in the lower right corner that I got him for Valentine's Day. He has completely ravaged it so that you can no longer tell it's actually a squirrel, but that little lump of cloth has provided hours of entertainment for him! My friend Suzanne gave me this necklace in January. It is from the an organization called Save Street Children Uganda. They are all about saving kids from the street, giving them an education, helping them to find a craft they can do to generate an income, and turning them towards Christ. 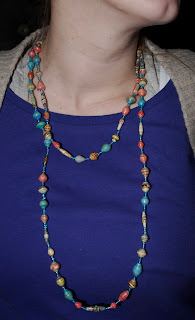 This necklace was made by some of the kids in their program. The beads are made of tiny pieces of rolled up paper. It is really beautiful and it made me feel really loved when I opened it. Because Suzanne saw the necklace, thought of me, and then bought it and sent it my way. Isn't that just amazing? She's a great friend and this is a beautiful accessory with an awesome message behind it! Do you have any clothing that has a hidden message behind it? If so, I'd love to hear about it! So fun! 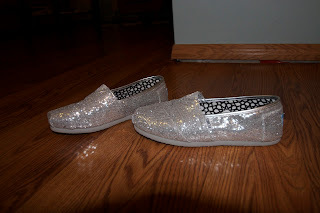 I love the glittery Toms and if I ever get a pair they will most definitely be sparkly : ) Also, I love companies that give back and even if I feel like the product is a bit overpriced, I gladly pay it because I know that it benefits someone else!